Artmusedog and I are rather exhausted from the storm tensions of yesterday. We did manage to do some creative art work for a fund raiser coming up. We did laundry, the sacred in the ordinary. We somehow managed to go outside and climb down the deck stair for her 'to do her duty'. I did carry her as I was a bit leery of getting blown away myself. The winds were quite strong but fortunately we 'weathered' the storm fine ~ no power outage and only small branches down. Grateful! Hope everyone else on the East Coast did as well. We wish you the best in each day. Awesome post Carol. 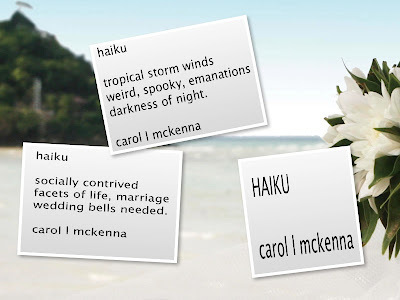 Nice set of haiku and you've already brought up our Carpe Diem prompt 'wedding bells' for tomorrow. Thank you for sharing your creativity with Carpe Diem. Wow, that's a dramatic sunrise! Glad you and AMD came through the storm without problems. Have a creative week! Glad to know you two didn't blow away. Take care, stay inside for awhile! Lovely work here..thanks for sharing. Glad you've "weathered" the storm okay. Lovely post. good to know you survived the storm. the sunrise after the hurricane is dramatic. that the storm passes soon. Glad you survived the storm safe and sound. We had high winds and rain yesterday and woke up to snow this morning. Beautiful shot of the sunrise. your top haiku was so Sandy. So gald to know the worst is over and you all are safe. Nice Haiku. Have a great day! 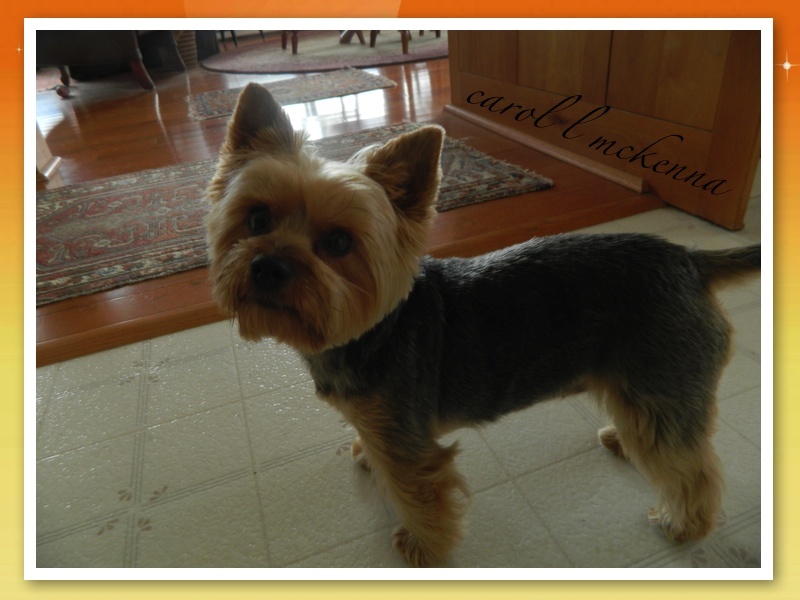 So glad you are okay and your little Yorkie is so cute. She is so cute. I'm glad you made it through the storm unscathed! Glad you were able to weather the storm without incident. That sunrise photo looks like you were staring it in the "eye". ArtMuseDog is so adorable! I am so very glad you're both doing okay. Soooo cute, I want to hug your fur baby! Nice words and pictures, - inspiring! Love the quotes in your side bar as well. I am glad you survived the tornado. It was terrible and I also hope that the other bloggers weren't harmed either. Thanks for your comment. Good to hear you have come through the storm ok. Your dog is gorgeous and so well groomed. Okay, my haiku stinks, I'll just leave it to the pros from now on. :-) But I am glad to hear you escaped the worst of what Sandy doled out, and even have electricity so you could share your awesome sunrise photo! What a symbol of hope that is. My son, Johnny and I went down to see what the waves were like at Lake Michigan yesterday. I will post photos soon look for them. I found the waves were not as high or scary as expected but the lighting was weird. Glad you were safe and the little doggie too. See you next week. I can be sure Sandy has nothing to do on you once I read you updated post. Here's hoping you and ArtMuse Dog are safe. Poets and photographers have some of the most beautiful jobs in the world. Two very different haiku. Enjoyed both. Glad you and your sweet dog are safe! Do you have a lot of clean-up to do after the storm? Have you a BLESSED WEEK!!! It must have been a huge relief to see that sunrise after the big storm! 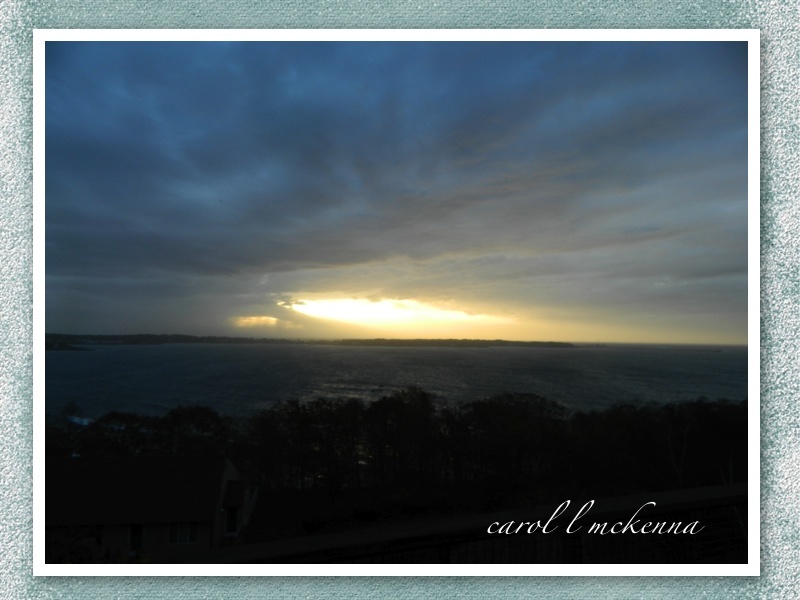 Glad to here that you missed the worst effects of the storm and enjoyed the sunrise. Very glad to hear both of you weathered in storm in fine form!! I love the pet picture !! Glad to hear you and your home are ok.
My heart goes out to those that have lost so much. Great photo - it is like the calm after the storm. Hi Carol, The sunrise photo is lovely. The storm was huge and a disaster for many. I am glad you are ok with little damage. I love the pic of your muse dog. What an adorable pup. Muse dog is so small I too would have worried about her blowing away. Smile! Superb shot. So pleased to learn all is ok with you! Thanks for stopping by - have a good weekend. So nice to hear you made it through the storm. I love the sea picture! Your haiku are wonderful! So glad the storm has passed and you are both okay! The clear day of your photo the morning after is a great shot! We survived the storm her in PA intact too..a little more damage but nothing too severe. happy that the storm didn't cause you too much trouble. my heart just breaks for the people in nj and ny. as usual, i have only to see that precious little dog of yours and just smile!! Enjoyed your haikus. Love the dog. So glad you managed to weather the storm - and do something creative! Your little dog is so sweet! Sure am glad that hurricane is over! Thank goodness for a new day. With much less rain and wind. Thanks for the comment over at Monday Art Day! Glad you are safe. Such a sweet doggie. I am loving the new frames you are using around your pictures...kuddos to you. Art Muse's coat is SO shiny in the images...beautiful. I am so happy to hear that you are alright after Sandy and your sweet little friend as well. Glad you weathered the storm! Glad to know you are all safe and sound. It has been a terrible week for the poor east coast. I'm glad you came through the storm okay. We only had relatively short power outage - so I'm not complaining! Beautiful photo after the storm! Spooky weather, indeed. Many are suffering. I am happy Sandy has already passed and you and your cute pet are ok. Your two haiku are very well written, as usual. The sunrise after the hurricane, new hope and prayers for the victims. That was one enormous storm! Especially when you looked at it on the satellite map. Glad you are safe. I felt guilty about our perfect weather here -- (and still will be with us through the weekend)while so many others were having such a terrible time. You have a perfect Christmas card there! Love it! Glad you did okay in the storm! AMD looks so pretty with a haircut! Glad you are safe, Carol. Love the Christmas card. Your dog is so cute. I'm glad you all made it through the storm unscathed! 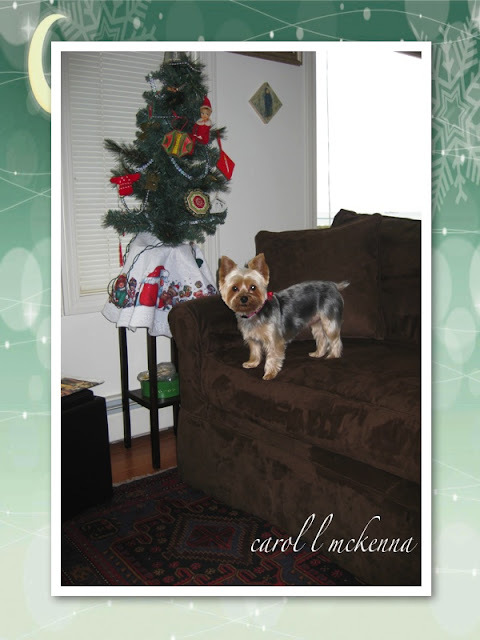 That is one of the cutest Christmas cards I've seen!